Special-teams play requires exceptional athletes. 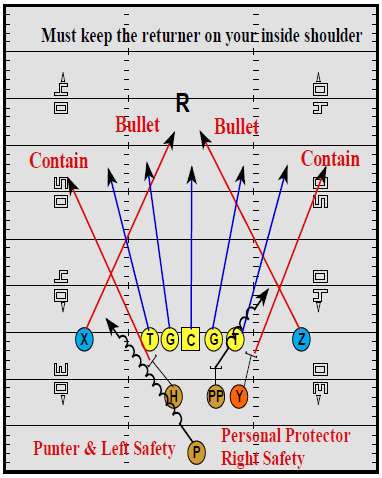 As such, each coach must work at identifying players with unique talents such as the ability to catch punts, sure hands for holders, confidence for kickers. etc. The players must be athletic, with great hand-eye coordination, and an incredible desire to compete. Balance, agility, and speed with the ability to play in space are qualities of a player that can contribute to special teams play. However, the most important characteristic is unselfishness — one heart beat with team. The better the athletes you have on your special teams, the better your special teams will be. For example, average players with a great scheme will yield average special team results, but good players with an average scheme will yield good results. However. good players with good schemes will yield great results. An athlete is a player that knows what to do and how to do it. Put as many of those types of players as you can on your special teams. The front wall Ends and Tackles will set their back foot on the 47 yard line with forward body lean towards the kick-off unit. The front wall should never retreat until the ball has been kicked. The Center will set middle on the 40 yd. line Our second wall (LE, RE) set their back foot on the 32 yard line at the top of the numbers and will be the outside blockers on the second wall. If the ball is kicked deep the second wall will always set their wall 10 yards in front of the returner. 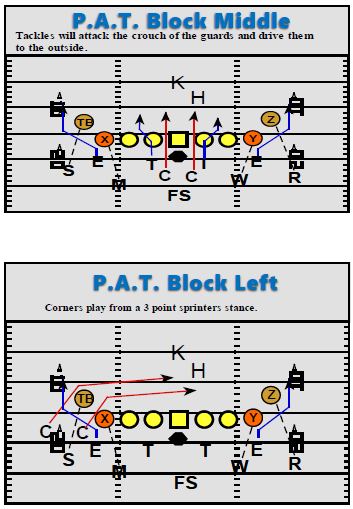 The right and Left up backs will align their back foot on the 20 yard line and will split the difference between the numbers and the hashes. 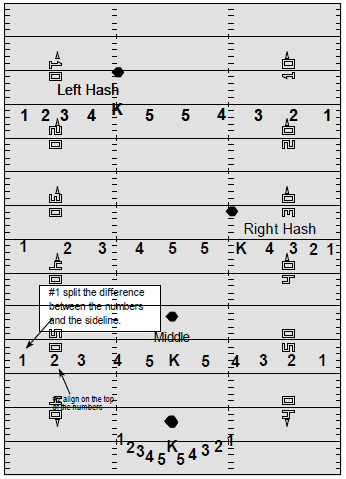 Right and Left Returners will align at the 5 yard line and on the hashes. 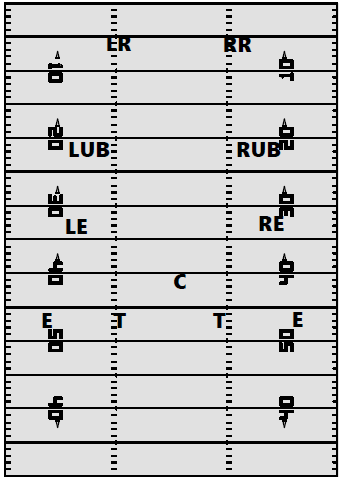 The back who leads the returner will lead the returner up and through the second wall. The lead back will take his path between the Right and Left Up-Backs. • Keep or establish the momentum with a big hit on the ball carrier. • Get the football back with a turnover – fumble, recovery of a directional kick, or recovery of on an onside kick. 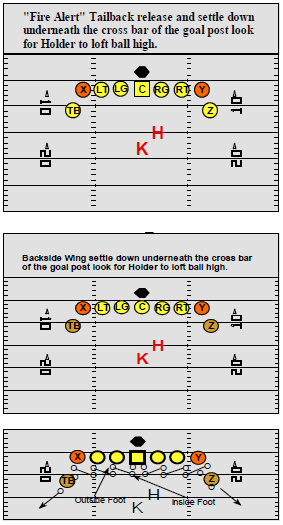 • Pin the opponent inside the 20-yard line or on a directional kick hold the returner to 5 yards. Our basic philosophy is to make our opponents defend the entire field by using a variety of kicks, directions, and ball placements. This helps us avoid being predictable which can give our opponents an advantage. We will not kick it straight down the field hoping for hang-time and coverage. When you kick the ball in this manner, it allows your opponent to execute their kick return scheme. Why allow the opposing kick return specialist to break into the clear and head for the end zone? We want to eliminate one-third of the field, create some indecision and force them to scramble. • Set up an offensive score with a return of 20 yards or more. • Set the tempo with at least one big hit, per return. “Purdue” Punt alignment. This is a tight punt formation; however the three protectors create a wall at seven yards. kick for many of the same reasons detailed in the proceeding chapter. A directional kick, should take half the field away which allows our gunners to take specific aiming points. In general we want to kick away from a single returner. If our opponents have two (2) returners, we will consider a fake, and then we want to kick it as high and deep as possible. Each lineman will start with his inside foot located on the back heel on the next person inside. The inside foot his kicked inside the stance off the player to his inside on the snap of the ball. The tight end on the snap of the ball will kick his inside foot to the inside of the tackle and then will hinge with his outside foot. The Wing will start with his inside foot splitting the crouch of the tight end, on the snap of the ball the Wings will step outside at a 30 degree angle and will keep their inside foot stationary. directional call on the snap. This may require some movements by the players from the balanced look. This is still a defensive play, therefore gap control and pass defense must be accounted for. As such, we will protect against all fakes, while bring pressure from the middle or an edge. 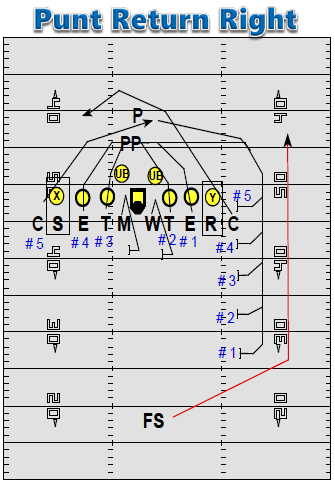 In general, we like to game plan the Try blocks and pressure field goals into the face of the kickers. Instant Download The 7 Essential Roles of a Football Coach! Enter your email address and click "Get Instant Access"